It’s my six-month anniversary at Xconomy, and I’m working to put together my first live event. As a native San Franciscan—I believe we’re known as “unicorns,” as folks on the tech side might say—I mulled over the theme and decided, what better way to get people together than to drum up a little hometown pride? So we’re gathering on the afternoon of December 17 in San Francisco’s Mission Bay neighborhood—the Bay Area’s new biotech epicenter—to talk about the emerging science, great ideas, and risk-taking strategies that will spur our area’s biomedical innovation for the next 25 years. I think you’ll like the people who have agreed to join us so far. 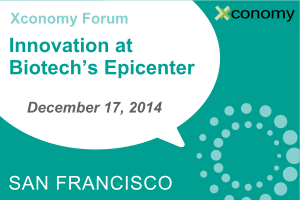 Xconomy Forum: Innovation at Biotech’s Epicenter will kick off with the University of California, San Francisco’s new chancellor Sam Hawgood talking about his institution’s central role in Bay Area biomedical research, healthcare, and entrepreneurship. Another new officeholder is joining us, too. California’s stem cell agency, known by its acronym CIRM, was an unprecedented only-in-California idea ten years ago: Our state’s voters approved $6 billion in tax dollars to fund cutting-edge, controversial research, new buildings, and funds to train and pay scientists. Headquartered in San Francisco, CIRM is now at a critical juncture, and it’s got a new leader: former biotech executive C. Randal “Randy” Mills became the new president July 1, with a mandate to turn the research CIRM funded in its first decade into treatments for patients. That’s the ultimate return CIRM’s founders promised to California taxpayers. I’ll interview Mills on stage, one on one, and ask about the pressure, and the plans for the next phase of CIRM. There’s plenty more on the agenda, including discussions about Big Data’s role in the healthcare revolution, synthetic biology, accelerators, and more. Wherever San Francisco and the Bay Area are out in front, shaking things up, we want to be there, too. Stay tuned for more additions to the lineup. In the meantime, for more information and to reserve your spot please visit our registration page. I hope to see you in December for what’s shaping up to be a great day.